Ray and Dorothy Berend have given $1 million to endow the Ray and Dorothy Berend Endowed Professorship in Accounting – the latest big moment in the history of the Greehey School of Business. The couple wants to ensure that, as faculty begin to retire, St. Mary’s University will attract and retain accomplished Accounting faculty members, who are rapidly decreasing in number nationwide. “Dorothy and I wanted to help recruit a faculty member who is committed to the St. Mary’s mission and will help guide Accounting students to graduate and pursue meaningful careers prepared to be exceptional leaders,” said Ray E. Berend (B.B.A. ’67), retired managing partner of Padgett Stratemann & Co. L.L.P. With this professorship, St. Mary’s is poised to continue and accelerate its tradition of preparing students to sit for the Certified Public Accountant exam or enter leading industries as accountants. Since 1993, U.S. colleges and universities have experienced a decline in accounting professors. In a 2008 report, the American Accounting Association estimated that 500 accounting faculty members retire each year, but there are only 140 new accounting Ph.D.’s each year to replace them. During his junior year at St. Mary’s, Ray Berend met with Leo Donahue, Director of Placement, and asked for help securing a job. Donahue recommended Berend call Padgett & Padgett, CPAs, as they were hiring a part-time accountant. He was hired and became one of Padgett Stratemann & Co. L.L.P.’s founding partners, and then managing partner in 1990, leading the company to become the second-largest accounting firm in San Antonio, with a staff of about 200 people. Berend retired in 2011 after 46 years of service. Berend continues to be involved with the Greehey School of Business as a member of the Advisory Council of Executives and has also participated as Professor-for-a-Day for many years during the school’s annual Business Week events. He has served as treasurer for the San Antonio Medical Foundation Board of Trustees, was a board member and past president for Roy Maas’ Youth Alternatives Inc. and was board member and past chairman for the North San Antonio Chamber of Commerce. 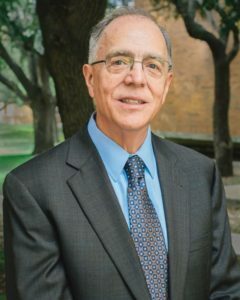 He is currently chairman of the board for the Daughters of Charity Services of San Antonio, which offers healthcare and dental services, as well as childcare centers, after school programs and counseling services to people in need.